We learned about the many success of Chicago Public Schools’ Farm to School and School Gardening projects at the Good Food Festival this weekend. It is so exciting to hear from others in our region making HUGE strides in the effort to connect students with where their food comes from, helping them forming life-long healthy relationships with food and agriculture. Way to go CPS! We hope to look like you someday! A few years ago, this lunch would have been illegal. 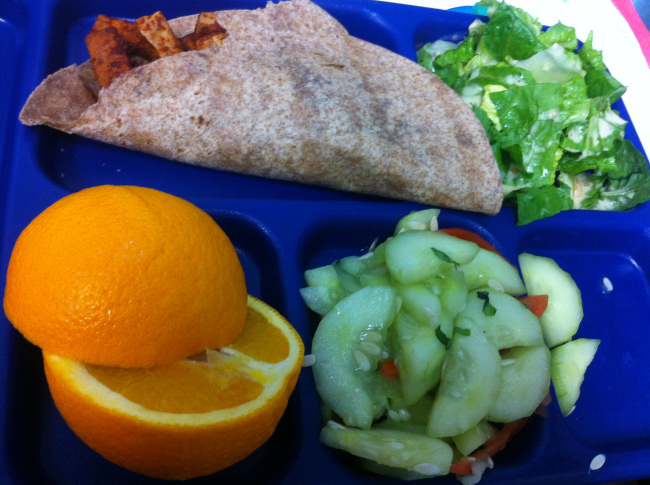 This delicious organic elementary school lunch of tofu (or chicken) with BBQ sauce scratch made by our dear Chef Eddie, paired with a green salad and cucumber-tomato-basil side, features basil grown in our edible schoolyard garden. This was the first meal served in our cafeteria to feature produce grown in our garden although we have been growing our own food since 2008. Until December of 2012, schools with edible gardens that were also receiving federal school lunch funds, including AGC and 400 other CPS schools, were restricted from serving the fruits of their labors to students at lunch. The organic heirloom tomatoes, peppers, herbs and greens, among other treats banned from our cafeteria, were sent home with parents, given to community members, sold at our Schoolyard Market.